Can you extend your technique to calculate the number of rectangles on a chessboard? All the red squares in the above picture would count as valid squares, so we are asking how many squares of any dimension from 1x1 to 8x8 there are on a chess board. In total there are 204 squares on a chessboard. This is the sum of the number of possible positions for all the squares of size 1x1 to 8x8. Formula For n x n Chessboard? There is more than one way of solving this. But it makes sense to extend our technique from the squares problem first. The key to this is to think of each rectangle individually and consider the number of positions it can be located. For example a 3x7 rectangle can be located in 6 positions horizontally and 2 vertically. From this we can build a matrix of all the possible rectangles and sum. In total then there are 1296 possible rectangles. Elegant approach to rectangles, consider the vertices and diagonals. I've been sent an innovative solution to the problem of the number of rectangles on a chessboard by Kalpit Dixit. This solution tackles the issue from a different approach. Rather than looking at specific sizes of rectangles and working out where they can be located we start at the other end and look at locations first. The vertices are the intersections. For our chessboard there are 81 (9 x 9). A diagonal starting at one vertex and ending at another will uniquely describe a rectangle. In order to be a diagonal and not a vertical or horizontal line we may start anywhere but the end point must not have the same vertical or horizontal coordinate. As such there are 64 (8 x 8) possible end points. There are therefore 81 x 64 = 5184 acceptable diagonals. 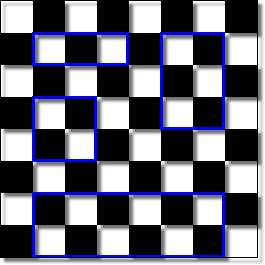 However, whilst each diagonal describes a unique rectangle, each rectangle does not describe a unique diagonal. 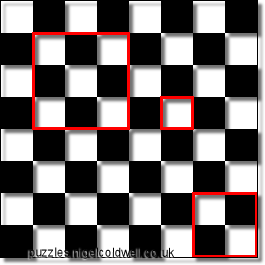 We see trivially that each rectangle can be represented by 4 diagonals. n x n or n x m? The n x n (eg. 9x9,) or n x m (eg 10x15,) problems can now be calculated. The number of vertices being given by (n + 1)2 and (n + 1). (m + 1) respectively. Hence the final solutions are as follows. Which can obviously be arranged into something more complicated.